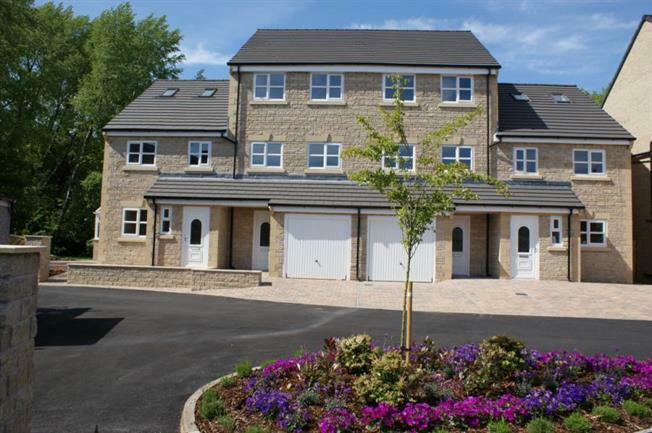 4 Bedroom Town House For Sale in Burnley for Offers in the region of £169,950. NEW HOME Entwistle Green are pleased to bring to the market this beautifully presented four bedroom town house with integral garage & parking. This stylish property comprises ample family living space briefly comprising; entrance hall, WC/cloaks, a spacious dining kitchen boasting brand new top of the range appliances, living room, four bedrooms, and two bathrooms. The property is located close to local amenities including good schools catchment, excellent motorway links, sport centre and bowling green. To the rear of the property there is a picturesque view of the river Calder from where this development takes it name! Viewing is highly recommended as this standard, size and specification is like no other. Call now! A range of fitted wall and base units, integrated Neff oven, hob, splash back tiles, ceiling light point. uPVC double glazed window to the rear, ceiling light point and a radiator. A four piece suite comprising of; low level WC, pedestal hand wash basin, shower cubicle and panelled bath. Splash back tiles, ceiling light point and extractor fan. uPVC double glazed windows to the front, ceiling light point, radiator. uPVC double glazed window to the front, ceiling light point and a radiator. uPVC double glazed window, ceiling light point and a radiator. A three piece suite comprising of low level WC, pedestal hand wash basin and panlled bath. Tiled walls, ceiling spot lights and a radiator.